We've looked previously at using the open source tool https://www.packer.io/intro/ from Hashicorp to automate the process of building Azure VM images, which can then be consumed using either single VMs or VM scale sets. By using this tool and some PowerShell DSC scripts, we have been able to automate the process of spinning up a VM in Azure, installing the required software and configuration, running Sysprep and capturing an image. So far we have done this by running our Packer script manually from the command line. If we are to move this process into production, we are going to need a way to regularly run this process in a consistent manner whenever we want to update the image (to apply updates, install new software etc.). We also need a way that other users can easily trigger this process without having to learn packer. This is where a CI/CD solution comes in. We are going to use Azure DevOps to create a build that will allow people to create a new image with a few clicks. 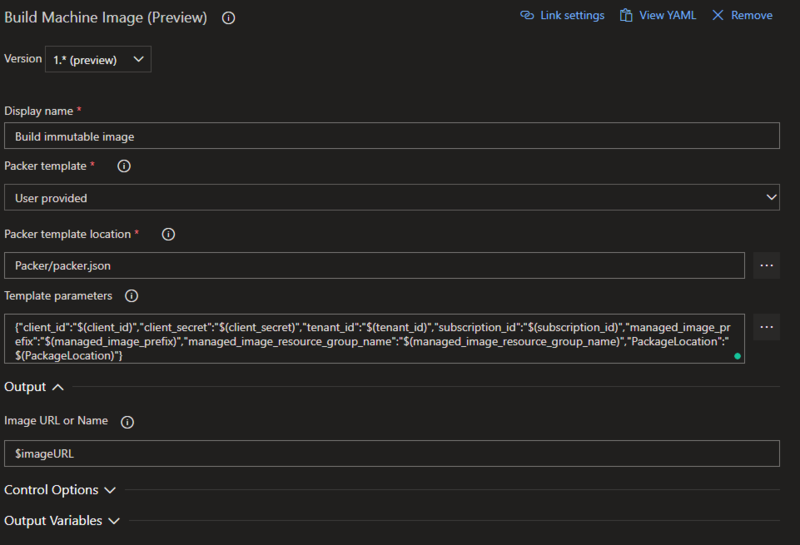 We're going to use Azure DevOps because it is what I am familiar with, it is easy to get started and available for free; however, this process could also be done on a different CI/CD solution such as Jenkins. I'm also going to assume that you have an Azure DevOps (formally VSTS) account to follow along with. If you don't, you can get one for free here. You should also go ahead and create a project that your code and build will sit in, either a new one or add to an existing project. The first thing we need to do is get our Packer, DSC and any associated files into a place where Azure DevOps can access them, the best way to do this is to put them into version control. I'm going to use Github to store my files, so they are publicly accessible, but you can use private Repos or use Azure DevOps repository to store the data. You can find my demo files here. 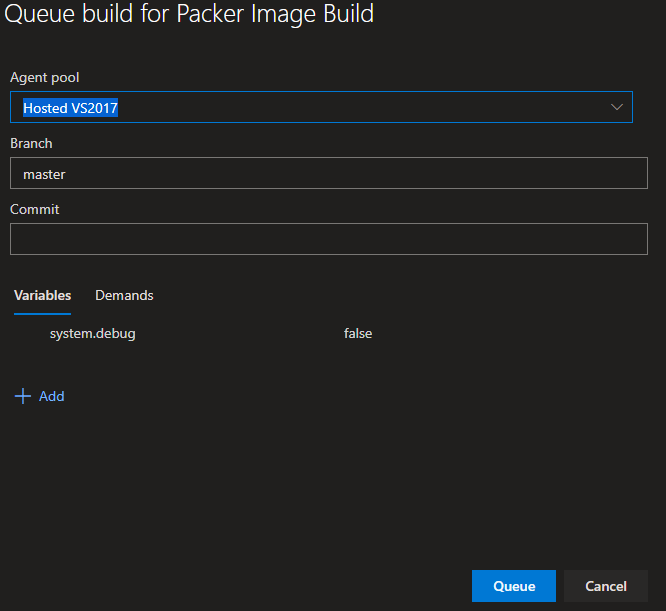 Coming up, we're going to use an Azure DevOps task to build the image with Packer, and this task includes a part which supplies a version of the Packer executable. Unfortunately, the version of this executable can be pretty old, so we are going to supply our own Packer executable, which we can update as required. To do this, the first step is to add a copy of Packer to our Git repo alongside our code. Later in this post we'll add a build task to set Azure DevOps to use this exe. We need to provide a copy of the DSC provisioner alongside our code; else the build will not be able to find it. However, there is a bug with DSC provisioner which can cause us some issues. The provisioner has been hardcoded to expect a "tmp" folder to exist in the root of the drive the provisioner is run on. If you're running a custom build agent, then you can go ahead and create that directory and use the current release of the provisioner available here (you want the Windows x64 version). If you're using a hosted build agent, however (which is going to be easier), then you can't create this folder. Instead, I have updated the provisioner to remove this hard coding and allow it to run, you will need to download my version of the provisioner here, or if you would prefer to build it yourself, you can download the source here. I have submitted a pull request to get this back into the main project. Commit this back to your repository. On the next page, you will be asked to select the type of build to create. The top option is to create a Pipeline defined in YAML; arguably this is the best approach to use because it allows you to store your build configuration as a file alongside your other code in your repository. However, writing the build as YAML does take some knowledge of Azure DevOps and the various build tasks, which can be challenging for those new to Azure DevOps. You can instead use the visual build tool, and this is what we will use here. I will also provide a YAML definition of the build when we complete it. We're not going to use any of the pre-built templates, so click the option at the top to "Start with an empty job". This should then take us to a new visual build, the first thing to do is to change the Name of the build to something useful. We also to make sure that the build agent select is appropriate for the scripts we are going to run. For windows, use either the "hosted VS2017" agent, or if you have custom windows agents, you can use them. Given this, we want to move the variables to be stored in Azure DevOps securely. Inside your build, you will see a variables tab. The first thing to do is to copy across any variables you think should either be secure, or you may want to change, into Azure DevOps. Be sure to set the sensitive ones to be secret in Azure DevOps. In my setup, I have chosen to put the service principal details in here, to keep them secure, and then also add the name and resource group to use for the created image, and URL for our web app package download so that these can be easily changed. We need to add a variables section to the top of the script that defines what variables the script will accept. We will set their value to an empty string for now. 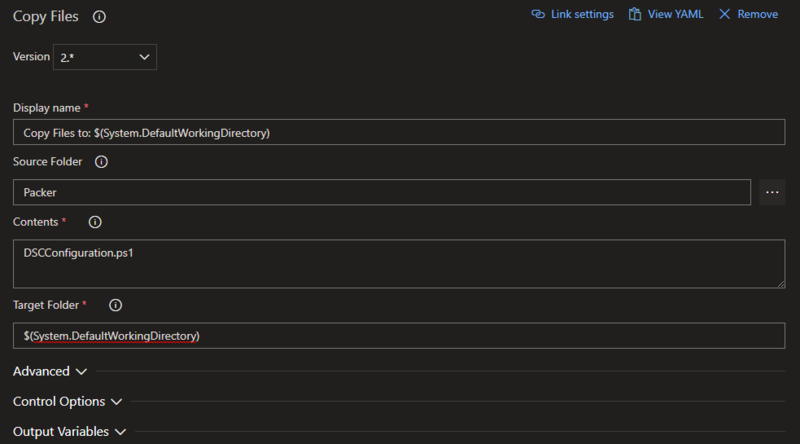 The last variable "workingDirectory" we set to use the system.defaultWorkingDirectory variable that Azure DevOps creates. "Set-PSRepository -Name PSGallery -InstallationPolicy Trusted"
"& $Env:SystemRoot\\System32\\Sysprep\\Sysprep.exe /oobe /generalize /shutdown /quiet"
We'll commit these changes to our script back to Git, so we are ready to accept these variables. The build process to create the image is going to take a while, an hour or two. By default Azure DevOps will time-out the build, so we need to make a couple of changes to avoid this. We need to amend the timeouts in Azure DevOps to match our process. To do this, edit the build we created earlier and go to the options tab. On the right, you should see a "Build Job" section, with a "Build Job Timeout in Minutes" value, which will default to 60. Change this to 180. Save this change and commit it back to the repository. We are finally able to create our build steps. 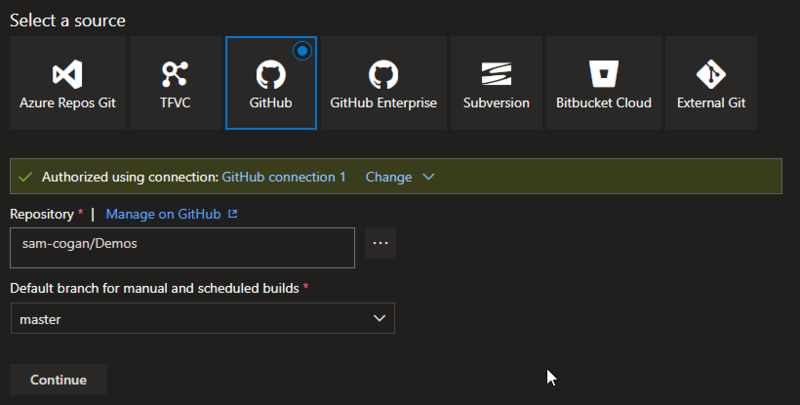 Open up the build we created in Azure DevOps and go to the Tasks tab. 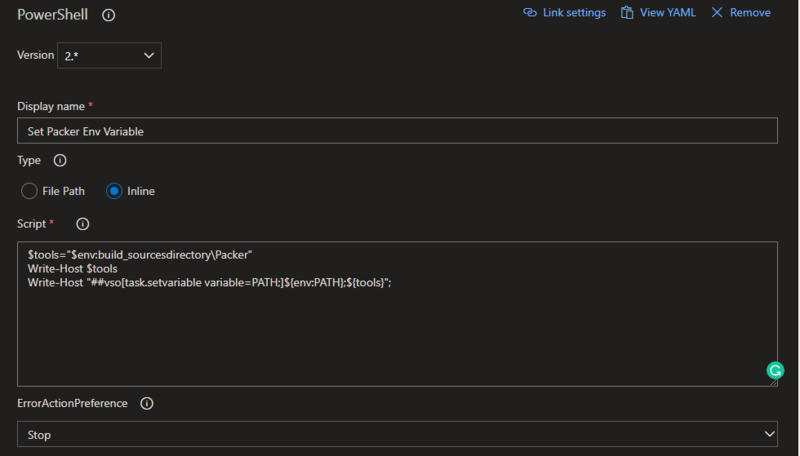 The first step is to set an environment variable so that Azure DevOps will use the version if Packer we provide. 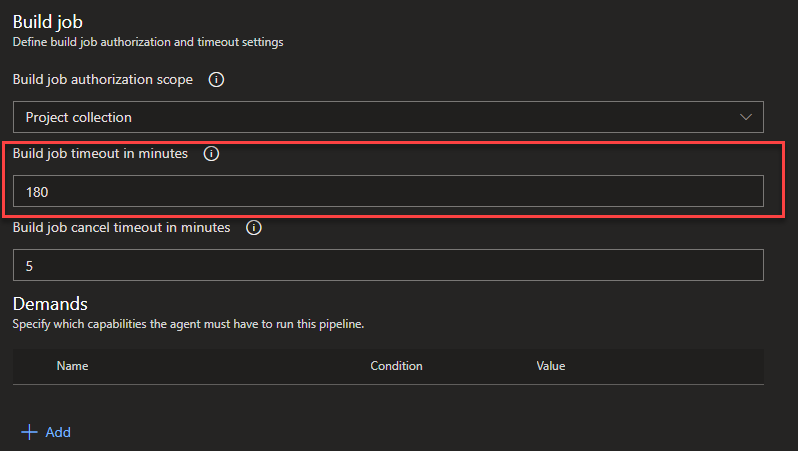 Click the plus button at the side of the agent phase and click on the PowerShell task. Provide a sensible name for the task, then select the inline option, and enter the following code in the script box. Change the path of $tools to match the folder where packer sits in your repo. For some reason, when Packer looks for the DSC files we want to run on the VM to upload them, it looks in the root of the working directory, not in the project root. I'm sure it's possible to change this, but the easy solution is to add a task to copy these files to this location. It's finally time to build the image. Again click the plus button and search for the "Build Machine Image" task, add this. The first thing to do is change the version drop down to version 1. This is the only version that understands managed disks, so we need to use this. Next, give the task a name, then we need to change the "Packer Template" option to "User Provided" to allow us to use or json file. In the template, location section, select the packer json file we created. Finally, in the output section, enter a name for the variable you want the path to the managed disk to be output into. Click Save, and we are done. Skip this if you are not interested in YAML build definitions. Now that we have the build created, we can trigger a build to create an image. On the build page, you can go ahead and click the "Queue" button. This will open a window asking you to select a branch and a build agent to use. You should be able to accept the defaults if you configured things correctly earlier. Click Queue and the build will be started. You are provided with a link that you can click on and watch the build progress if you wish. After 1-2 hours depending on how complicated your DSC is, you should see the build complete. If we take a look at our destination resource group, we will see our managed image has been produced. We can use this image to create new VMs or new VM scale sets as usual through the portal, CLI or ARM template. You can also use the output variable in the build to pass the reference to the image to other steps in build or release to automate the whole process of creating VMs. I appreciate this is a reasonably complex article with lots of steps, but once you've done this once it should make sense. Please do comment with any questions or issues, and I'll be happy to help. You can find a full copy of all the files I used in this demo here - https://github.com/sam-cogan/Demos/tree/master/Packer.